Bad breath, chipped teeth, inflamed gums, and an improper bite are all issues that need to be addressed. Dr. Shu Ping Rong corrects these issues with personalized braces appliances to give children, teenagers, and adults in Lower Manhattan a beautiful smile. Dr. Rong has completed extensive training in orthodontics, and her team supports her expertise with their own wealth of knowledge. When you need traditional orthodontic solutions and aesthetic options for this treatment, Shu Ping Rong, DDS, offers all that you need. We see patients from age seven and up for orthodontic examinations and to provide treatment. Our care is gentle and comprehensive, ensuring you the best smile possible. Call us today to consult with Dr. Rong on you or your loved one’s orthodontic needs. At Dr. Rong’s practice, our team diagnoses and resolves these issues to give you a smile to be proud of. We take pride in the process of shifting our patients’ teeth and jaw into proper alignment, and we strive to do so preventively, protecting them from long-term developmental issues. We tailor braces to each patient’s needs and goals for their oral health. Treatment plans are made to target the specific occlusal issues we discover through X-rays and an examination of health records. Instead of using a standard approach for everyone, we may mix and match various solutions to enhance the success of your treatment. From appliances and braces for children to cosmetically-minded braces for adults, we have all that the family needs. Children from seven to 11 may need orthodontic intervention to correct particularly severe cases of malocclusion. We combine modern appliances and traditional braces to gently adjust the size of the jaws and bring teeth into place. This first phase of treatment may deter the second round of braces, as long as care guidelines are properly followed. Teenagers and adults have orthodontic needs that often go unaddressed. Dr. Rong provides efficient and customized care for these patients, correcting the smile as comfortably as possible. Our practice utilizes cutting-edge materials to make treatment as comfortable as possible. We offer tooth-colored ceramic brackets and many options for ligature coloration, allowing patients to customize their care. 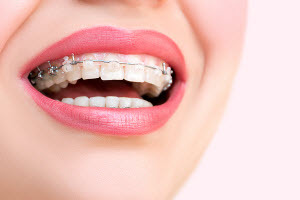 Those who are aesthetically-minded can minimize the impact braces have on their appearance. Our practice serves Lower Manhattan, Chinatown, and Lower East Side with family dental and braces care. For advanced treatment options from a compassionate team, call us today!